A loan of $6,000 helped purchase a food trailer to take Sugar Hill on the road. My husband and I both grew up within two miles of our little town. We've had opportunities to move over the years, but I always wanted to stay in the mountains. My husband worked out of town for ten years while our children were young. He left home every Monday and came back every Friday. He had to follow jobs as they became available. We wanted him to be able to stay at home, so we purchased an existing business, a small hardware store. We worked that business for more than eight years, and simultaneously opened an overnight stay business for visitors to our town by converting monthly rental property to short stays. We collected the first lodging taxes in our town in over 40 years. Visitors to our suites and cottages routinely asked where a good place to sit down and have a beer was located. The answer was miles away! So we saw another opportunity, and Sugar Hill Brewing Company was born. We pride ourselves on always moving forward without fear. We never let the fear of failure stop us from making what we consider a good business move. Have we had scary times? Of course! But we always work hard and work smart, and we find a way to improve. Life is much more interesting when we look for possibilities to help ourselves and our region. It helps small business owners expand their community oriented Brewery. Sugar Hill Brewing Company was the original brewpub in the Heart of Appalachia region of Virginia. My husband and I started the business because our town needed a restaurant where locals could gather. We live in a town of fewer than 1,000 people, so we wanted something unique to draw people from far beyond the borders of our town. Having a working brewery was the perfect solution! We knew that craft beer lovers traveled long distances to sample new products. Within the first month of operation, we knew that our plan was a success. People were traveling from all over the county to come to the brewery. People began to travel from the Tri-Cities and beyond. We estimate that 80% of our guests travel more than 30 miles. Still, not everyone can make the trip to us, so we want to expand our market by taking our food to them! We want a mobile kitchen where we can serve our core menu offerings and expand our lunch crowd and add catering events into the mix. The reaction from our customers is overwhelmingly positive. People love our food and our award winning beer. We love the entire Heart of Appalachia and believe that this food trailer will add a very important component to our emerging economy. This loan, in conjunction with a grant that we just received, will allow us to purchase a food trailer for a new division of our brewpub Sugar Hill Brewing Company. 'Sugar Hill on Wheels' will be the mobile portion of our business. We plan to travel to large businesses for Food Truck days 2 or 3 days a week. We will also attend festivals and cater private parties. We expect this portion of our business to add approximately $50,000 per year to our gross sales in the first year and add another 5% to our profit margin. By year three, we expect to add $100,000 in annual sales. We will hire three additional people on our staff as a direct result of this food trailer. This will increase the visibility of Sugar Hill Brewing by taking our excellent food out to people who might never travel to our town to visit our brewpub. We will also take beer to eight events per year in conjunction with the food. We will be the first brewpub in our area to have a mobile facility. We love breaking new ground! About Sugar Hill Brewing Co. 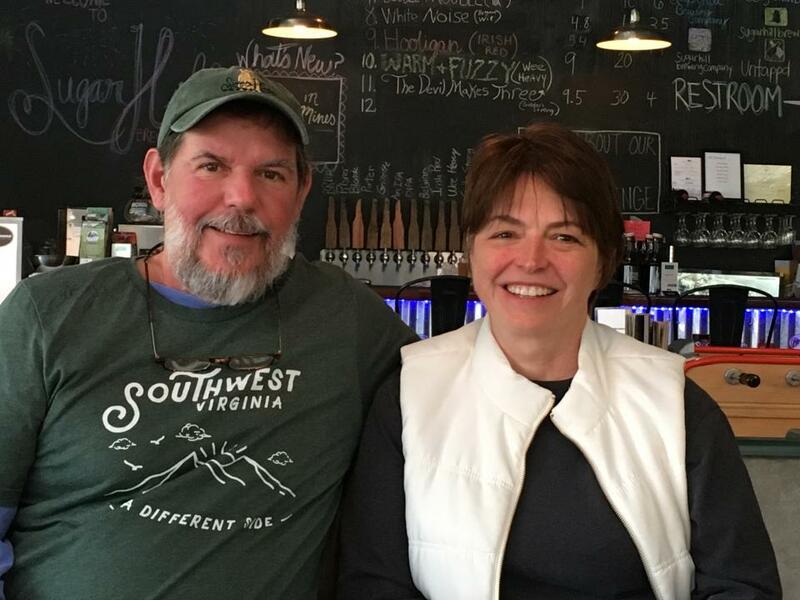 Opportunity Southwest Virginia is pleased to endorse Jennifer and Sugar Hill Brewing Company. Jennifer and Greg are actively sharing their spirit of community investment in Southwest Virginia and modeling the way for other community minded investors in the town of St. Paul. Jennifer successfully participated in business plan competitions in the region that layer technical support and training with network building and financial support. She and Greg are constantly learning and sharing their knowledge, encouraging others to explore their business dreams. The businesses strategies Jennifer and Greg are developing fit the needs of the community and are integrally tied to community and regional strategies. Southwest Virginia is not only a place to visit, but it's a place to work, live and invest. The mobile truck will provide an important support service for several larger businesses. Food trucks are new in this area, and employee services such as this can make it easier for an employer to provide a quality workplace.